Visitors at the 2016 VDMA International Rotating Equipment Conference. The VDMA has announced that its Call for Papers for the International Rotating Equipment Conference 2019 has now closed after attracting an excellent worldwide response. 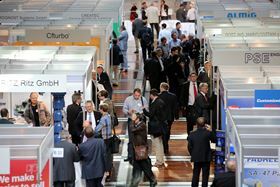 The 2019 International Rotating Equipment Conference will take place from 24 - 25 September 2019 in the Wiesbaden Congress Centre. Christoph Singrün, managing director of VDMA Pumps + Systems and Compressors, Compressed Air and Vacuum Technology, said: "Visionaries and specialists from the pump and compressor industry worldwide followed our call to submit their proposals for technical papers online. We were particularly pleased with the suggestions from pump and compressor users, who are among the world market leaders in their market segments." At the end of January, the programme committee along with high level representatives from the world of science, manufacturers and operators will select the best lectures. The preliminary programme will be published on the conference website from March 2019. Those who missed the deadline for submitting a technical contribution can still participate in the event and book a stand at the accompanying exhibition online, become a sponsor or register as a visitor. The VDMA represents more than 3,200 companies in the medium-sized mechanical and plant engineering sector.